Heat oven to 375°F. In medium bowl, stir cookie mix, oil, water and egg until soft dough forms. Shape dough into 12 balls, using 1 1/2 tablespoons dough for each. Place balls about 4 inches apart on ungreased cookie sheet. Shape remaining dough into 24 balls, using 1 teaspoon dough for each. Insert stick into side of each large ball; place 2 small balls next to each large ball for ears. Press balls evenly until about 1/4 inch thick. Bake 11 to 13 minutes or until edges begin to brown. Cool 2 minutes; remove from cookie sheet to cooling rack. Cool completely, about 30 minutes. 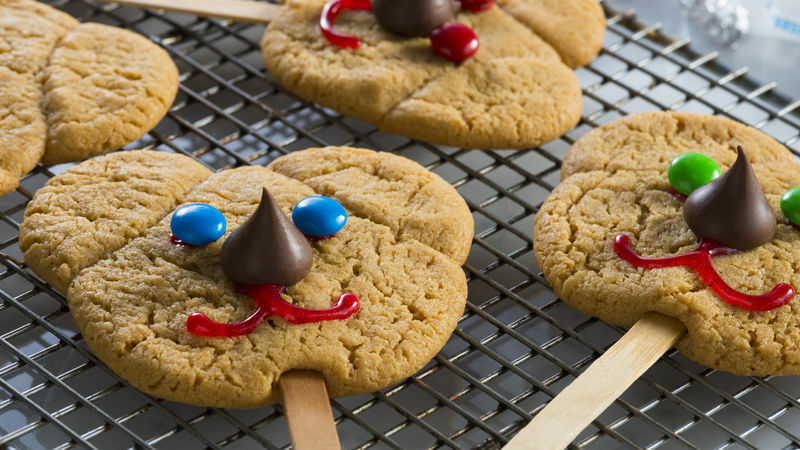 Add 2 flat candies on each cookie for eyes and 1 milk chocolate candy for nose, using gel to attach. Squeeze on gel for mouth. Make Bear Paws! Shape dough into 12 balls; place on cookie sheet. Insert stick into side of each ball; press dough until 1/4 inch thick. Press 4 jelly beans into each cookie about 1/2 inch from edge for toe pads. Press 1 chocolate chip at end of each jelly bean for claws. Bake as directed; cool completely. Spread each cookie with 1 teaspoon chocolate ready-to-spread frosting for paw pad. Wrap cookies in plastic bags or plastic wrap and tie with colorful ribbon for a child’s party gift. It’s a great way to send party fun home!